Okay this is the situation, I have a external HD that is Windows 7, I took apart my old laptop and took out the HD and put it in a external case trying now to boot it up on my Dell laptop. I turned on EUFI and click F12 to and select my External USB HD to boot this up, and it just keeps saying Repair (recommended) so I click that and I get this message error "This version of System Recovery Options is not compatible with the version of windows you are trying to repair. Try using a recovery disc that is compatible with this version of windows." Why is it telling me to repair my Windows I already have a Genuine Windows on my Ext HD. Why won't it just boot up normally? Is it because my external HD is a Windows 7 MBR, and not a GPT? You usually need to re install Windows when changing chipsets. If I'm not wrong, you also have to get a new activation code. I'm not sure about the last one though. The Windows activation service checks hardware configuration and uses a point system to determine if the hardware has changed so much, a new key is required. I can't find the page anymore that lists each product and it's weight, but swapping a motherboard exceeds the limit. To get it over properly (besides getting the key); you can put the drive in the original PC it came from and boot up. Uninstall any AntiVirus software and disable Windows Defender if used, then reboot. THIS IS VERY IMPORTANT. Failure to uninstall third party security software will make this process ruin your Windows install, often beyond recoverable. Make the following selections and do not interrupt until it is finished. Once it shuts down, then move it to the new PC. Edit: If you're moving the drive to another computer that had Windows 7 on it, you can use the key from that PC. 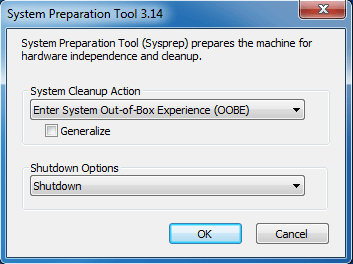 The sysprep process removes all activation and will ask for a new key. Once it boots though, all your programs, configs are still there. Edit2: And when you boot up and create a user, make the new username "temp". Reboot login using your previous username and delete the temp profile. MMmm, i got to remember this!!! I remember replacing the motherboard and the CPU and having the activation problem when I tried to reinstall Windows. All I did was calling MS thru the number on the disc case and they reactivated it to me when I explained it and confirmed its genuinity (if that's a word). Now I'm on my second computer with that genuine Windows 7 after upgrading it to Win 10 on the new computer. That was four years ago so it could have changed now. But to honor your main inquiry; you would be so extremely lucky if a Windows installation from one different computer runs fairly well on another, if not boot at all. Windows installs drivers specific to hardware it finds. If your goal is to take advantage of the genuine Windows from that laptop, you better reinstall it on the new computer. If you still want to try repairing it, you'll need a same Windows version installation disc and use the repair function from it. The new computer probably has a different version of as the repair told you.